This is the eighth climate-related complaint I have been involved with which has been upheld against the BBC in the last two years. There may of course be others that I am not aware of. In March 2017, the World at One made the ridiculous claim that sea levels at Miami were rising at ten times the global mean. The BBC were subsequently forced to admit that sea levels there showed ‘little divergence from the global mean’. In October 2017, the BBC broadcast an episode of Russia with Simon Reeve which linked the deaths of ‘tens of thousands of reindeer’ to climate change. After a complaint was submitted, the BBC accepted that reindeer populations were in fact stable or increasing. 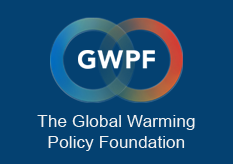 Written by Chris Fawkes, the BBC meteorologist, it categorically stated: ‘A warmer world is bringing us a greater number of hurricanes and a greater risk of a hurricane becoming the most powerful category 5.’ The actual data shows this is simply not true, as the Intergovernmental Panel on Climate Change (IPCC) themselves have made perfectly clear. Eventually, the BBC printed a correction that their claim was based on ‘modelling and not historical data’. In May 2018, Roger Harrabin wrote an article on the report of the Environmental Audit Committee which criticised the government’s clean energy policies. Harrabin claimed that investment in clean energy had slumped following a fusillade of policy changes, including a ‘ban on new onshore wind farms’. There has been no such ban, only the removal of subsidies. The BBC Executive Complaints Unit accepted that the article was materially misleading, and that there had been a serious lapse of editorial standards. In June 2018, John Humphrys interviewed Lord Deben, the former John Selwyn Gummer, allowing him to get away unchallenged with wildly inaccurate claims about wind power. In particular, Deben stated that ‘even where a community wants to have an onshore wind farm, it can’t have it’. In fact there is no such ban, and the Government has actually devolved the decision to approve onshore wind turbines to local councils. 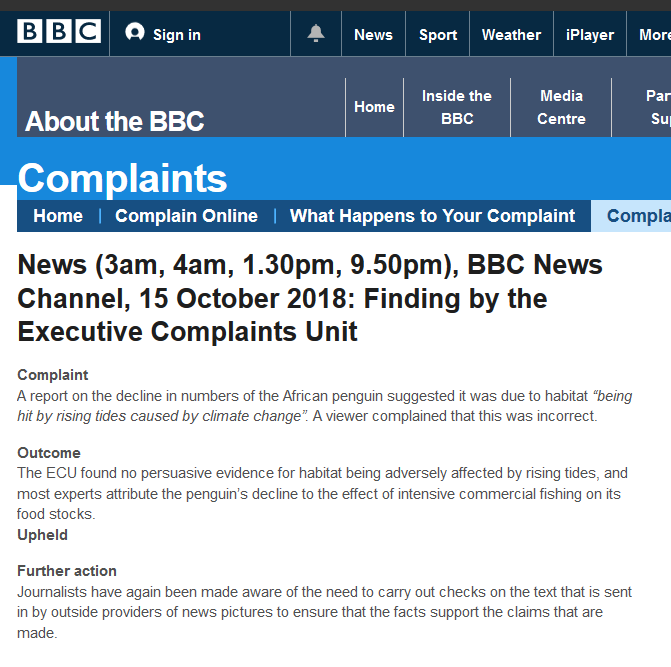 As a result, the BBC Executive Complaints Unit found that Deben should have been challenged on this point to ensure listeners were not left with a materially misleading impression. December 2018 saw an episode of the BBC Weather World programme, which was little more than a free puff for onshore wind farms. At one stage, the presenter casually commented that ‘already about 30 per cent of the UK’s power is produced by wind energy’. The actual figure is 15 per cent. Following a complaint, the BBC accepted their claim was wrong, and have now withdrawn that segment of the programme from their website. In February 2019, Roger Harrabin covered the newly published report from the Institute for Public Policy Research, ‘Facing up to the age of environmental breakdown’. Central to the IPPR’s case was this statement: ‘Since 2005, the number of floods across the world has increased by 15 times, extreme temperature events by 20 times, and wildfires seven-fold.’ [‘Since 2005’ was subsequently amended to ‘since 1950’.] Harrabin made absolutely no attempt to challenge or query this statement, or some of the other contentious claims in the IPPR report, despite the fact that it was patently absurd. Instead his article was effectively just a cheerleading exercise. The IPPR claim is in reality totally fake, as they misinterpreted the International Disasters Database used for their analysis. As the organisation which maintains the database makes totally clear, many disasters occurred in past decades but were never officially recorded in the database, purely because of better methods of reporting nowadays.